Rex Tillerson will deliver his remarks on "Defining Our Relationship with India for the Next Century" at the Center for Strategic and International Studies (CSIS), a top American think tank, a statement said. This will be Rex Tillerson's first India policy speech after becoming top US diplomat early this year. 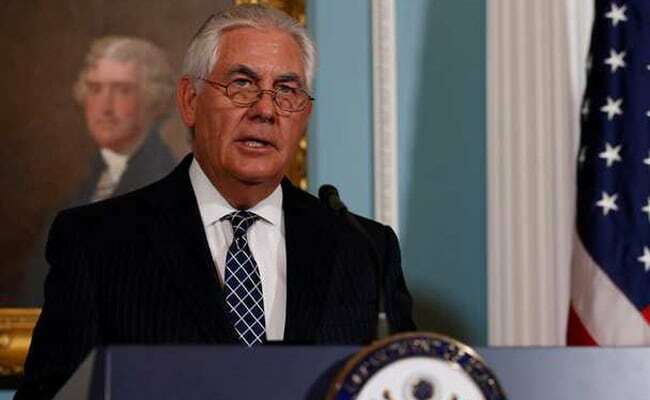 Washington: US Secretary of State Rex Tillerson will deliver his first major policy speech on India tomorrow, two days after Finance Minister Arun Jaitley ended his week-long visit to America during which he raised some of the key issues of concern with the American leadership. Mr Tillerson will deliver his remarks on "Defining Our Relationship with India for the Next Century" at the Center for Strategic and International Studies (CSIS), a top American think tank, a statement said. His first India policy speech after becoming the top American diplomat early this year, Tillerson's remarks comes ahead of President Donald Trump Asia visit which will take him to Japan, S Korea, China, Vietnam and the Philippines. Mr Tillerson had a meeting with External Affairs Minister Sushma Swaraj in New York last month on the sidelines of the UN General Assembly meeting. US President Donald Trump hosted Prime Minister Narendra Modi over dinner at the White House in June. After coming to the White House, Trump has committed himself to strengthening relationship with India. Last week, Mr Jaitley met Treasury Secretary Steven Mnuchin and Commerce Secretary Wilbur Ross during his visit to the US which concluded on Tuesday. He raised some key issues of concern to India, including the H-1B visas. Early this month, the first consignment of American crude oil reached India and the Indian companies plan to purchase crude oil worth USD 2 billion in the next one year. India has also placed a large defence order with the US worth billions of dollars.